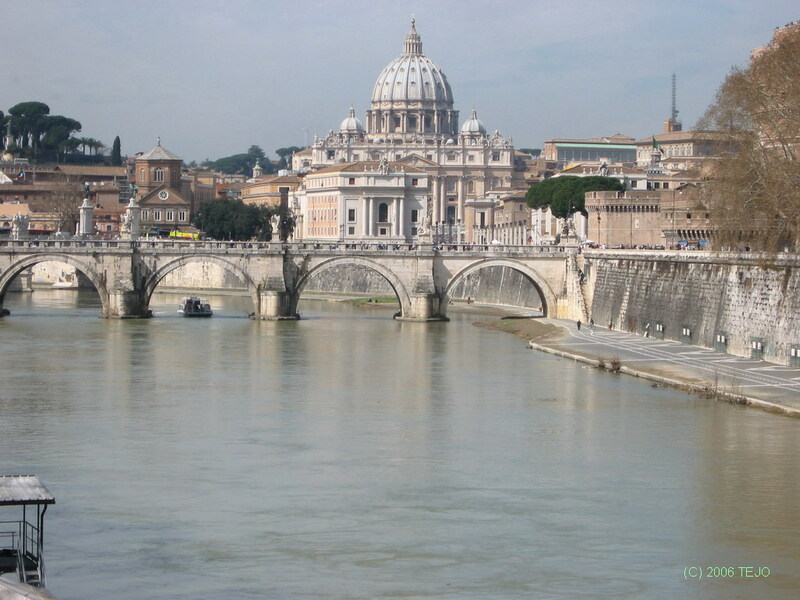 Does one really need a good explanation to visit The Eternal City? Not really - everybody with a sense of history or culture or architecture should visit this City of Splendours at least once during a lifespan, where attractions stand in line after one another. 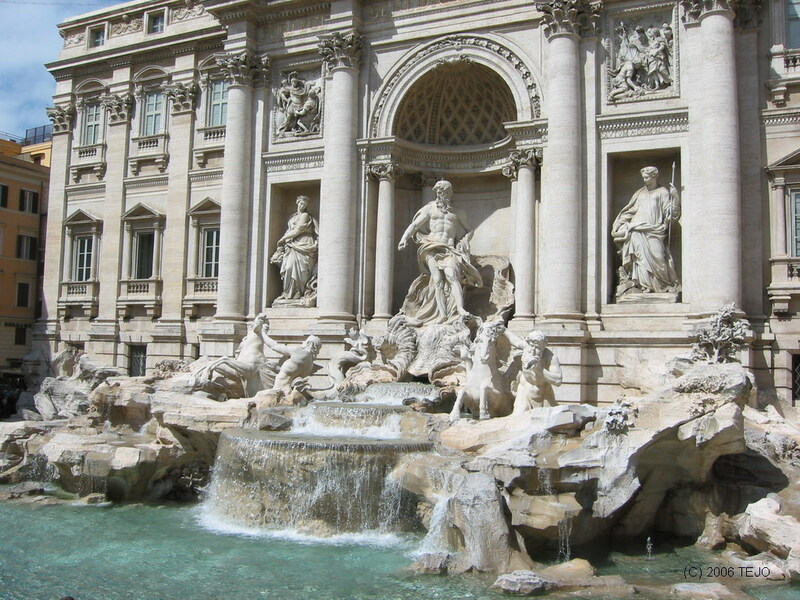 One visit could easily lead to another as well, whether you toss a coin into the Fontana di Trevi or not. The time had come to visit The Eternal City. 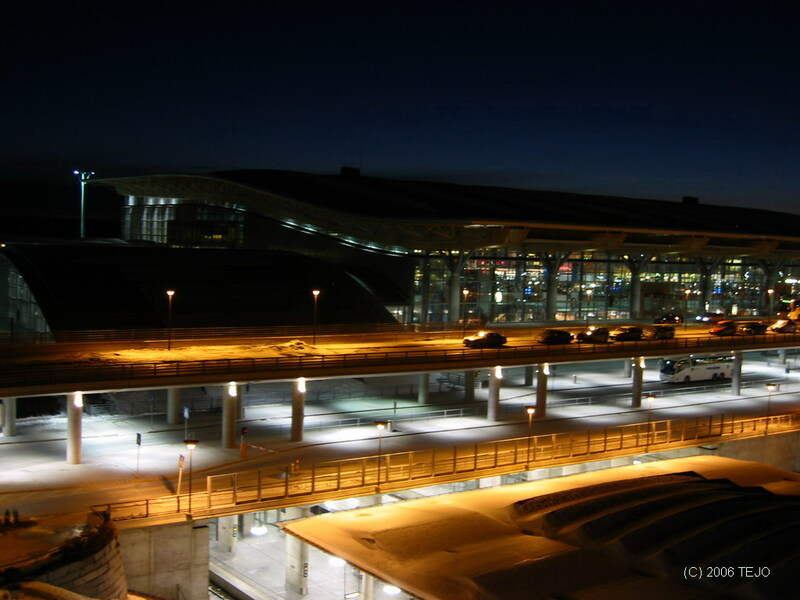 A map, a guidebook and some hotel browsing was done beforehand, and the Radisson SAS Es hotel was chosen, both due to its very convenient location as well as its well known standard. However, things were soon back to normal as the Leonardo "Express" was boarded and the course was set for Roma Termini (Rome's central train station). This express train could barely have travelled above 60 km/h at any time, often moving a lot slower and several times coming to complete stops for reasons unknown. The ride took more than 45 minutes, and would for us foreigners not qualify for the title of 'airport express train'. The hotel was very conveniently located right outside the exit from the platform where the airport (express) train arrives. Still, a scenic road was chosen, as the hotel sign wasn't visible from the station exit, leading to a bit of dragging of suitcases along the station area. 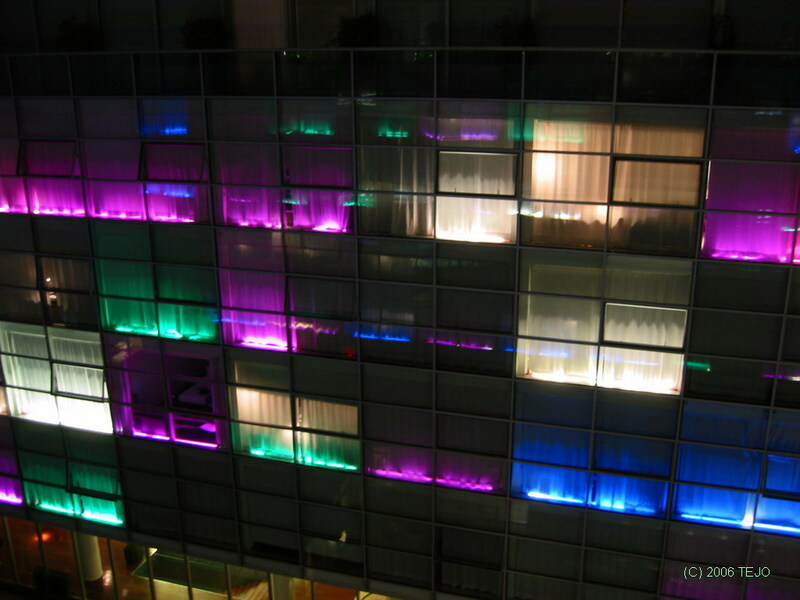 Once inside, the reception shows the first signs of this being a 'design' style hotel. It is very airy and spacious however, so it is a nice introduction. The reservation confirmation was a-ok, but upon entering the supplied room, it was obvious that it was not yet ready (a too early arrival at 14-15 or so? ), so another room was supplied, which was luckily ready for 'boarding' - referring to the design of the hotel, which is like an upside down ship. The rooms also show this clearly, as the floors resemble woodboards on a ship, and the side of the bed rises into an s-shaped curve of wooden boards - watch your bare feet here. More design-ish interior: an LCD TV, a lamp which fills up with gas once you turn it on, and a bathroom light which is controlled by a circular metal touchscreen. And no wardrobe - just an open rack for your clothes. The room itself was the smallest I have experienced with this hotel chain (6 visited so far), a third of which is occupied by the bathroom, which is spacious enough in itself. The roof terrace is an experience though. Formed like the bottom of a ship, it houses a swimming pool (only open during the summer) and commands a nice view over the station and the red rooftops around. It is a great place to rise above the traffic, absorb some sun, and relax after a hectic day of sightseeing. 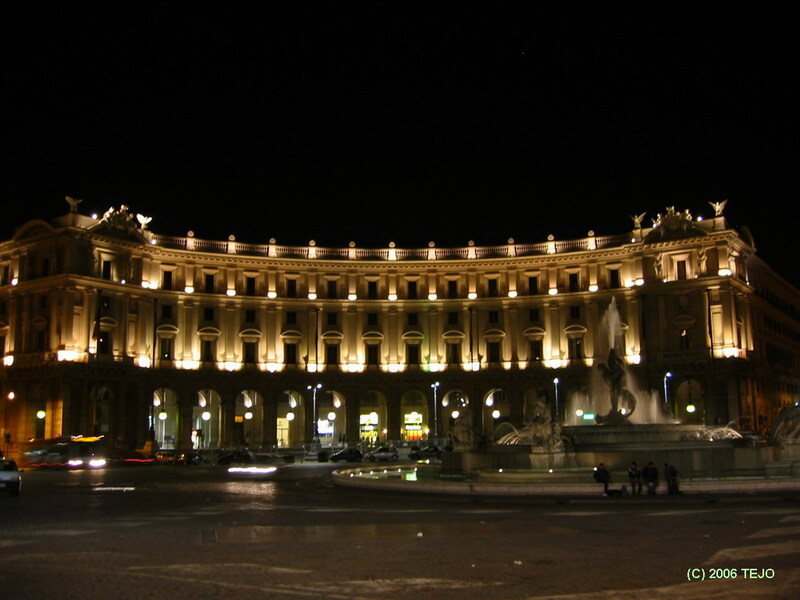 Even though the hotel is close to the central railway station, it is less noisy than expected - after all, Roma Termini is Europe's largest railway station, and the main building seems to cover an area at least half a kilometre in length. It was time for a bit of sightseeing, and it was already late afternoon, so the trip would have to be somewhat limited. 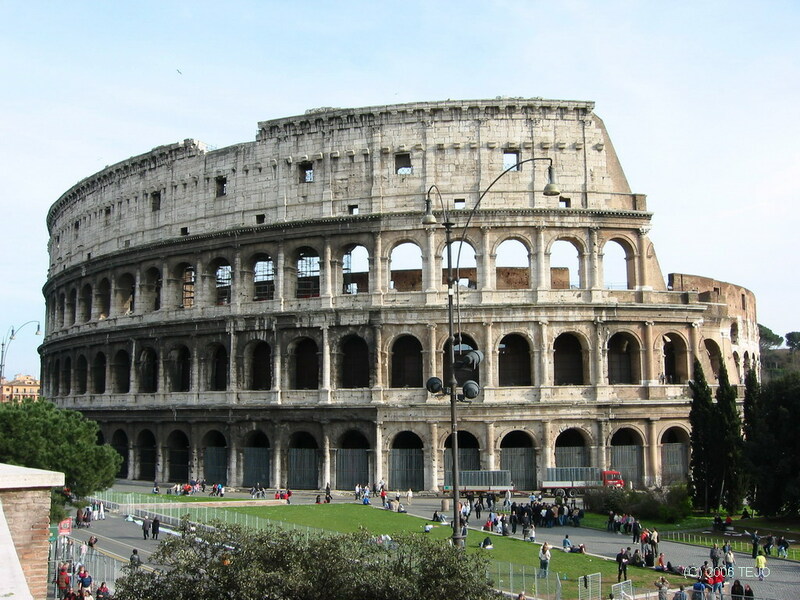 According to the map, Colosseum and Forum Romanum should be close, so this would be the chosen destination. 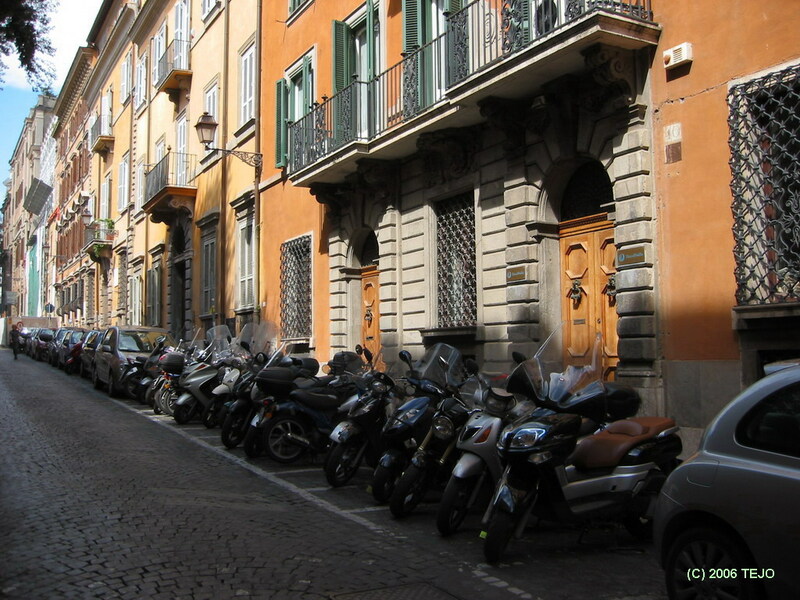 In fact, many of Rome's most famous sights are within walking distance of one another - the Centro Storico or historical centre isn't that big. Indeed, after only a few minutes of walking, the hulking walls of the Colosseum were visible at the far end of the road. It was an even more impressive sight than expected, and once there, the actual structure dwarfed any picture one might have in mind about how big it would actually be. There was a huge queue to get in there, yet the one where you got an audio guide was strangely empty. The choice was then obvious, as the audio guide is considered somewhat optional depending on your interest in details about the place. Parts of the arena floor had been rebuilt, which was not expected, as I recall no picture showing this. The actual arena was smaller than expected, but the side walls were still an impressive sight, as was the depth and extension of the room/hallway system beneath the arena, almost like a small catacomb area in itself. This area was used for housing animals, gladiators and theatrical scenery, as well as elevators and pulleys for easy access to it all. It has been said that the arena could even be flooded rapidly through the use of a nearby aqueduct, for creating replicas of sea battles. The Colosseum was built in AD 70-80 by Emperor Vespasian (finished after his death by his son Titus) and was originally named Amphitheatrum Flavium. Its opening was celebrated by 100 days of continuous slaughtering of animals, christians (heathens) and gladiatorial battles. It was said that the stench of rotting carcasses was only superseded by the scent of the women's perfumes. It measures 189 by 156 by 48 metres, and much of the structure has suffered damage over its nearly 2000 years of existence, such as earthquakes, fires and plundering of stone. Some scaffolding at the top of the outer wall was visible, although it seemed small compared to the structure itself. 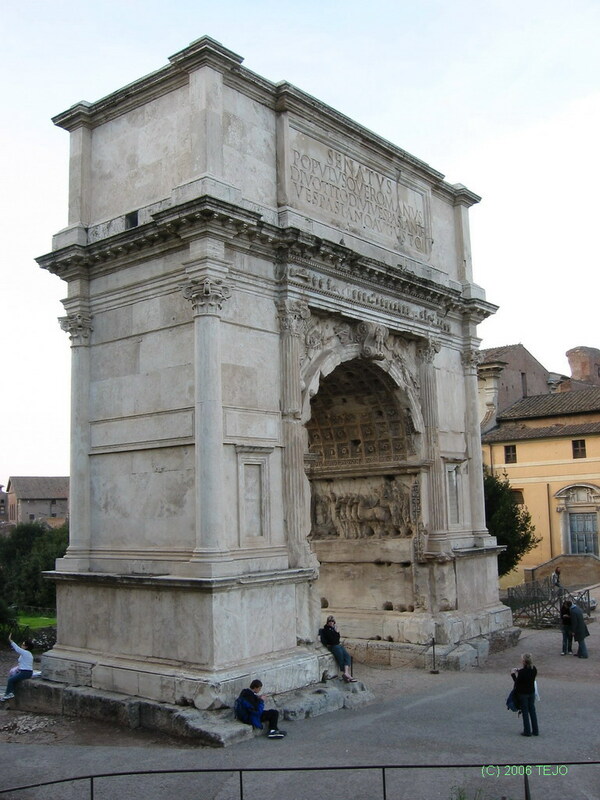 Just outside stands the Arch of Constantine, one of many triumphal arches in the vicinity, most of which are inside the Forum Romanum area, which lies just next to and on each side of the Via dei Fori Imperiali road. 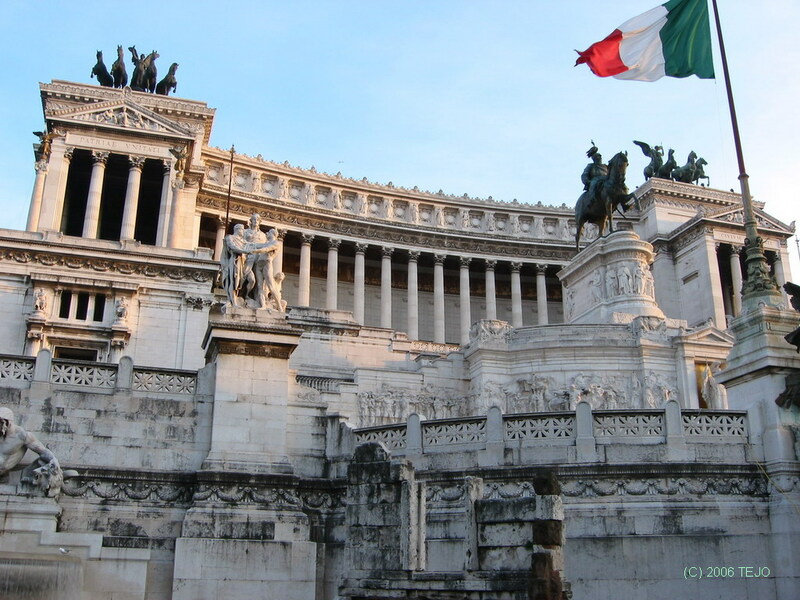 It was already 19 in the evening, therefore a bit late to pay a visit, so a stroll was made down the road instead towards the Piazza Venezia and the hulking monument to the first king of a unified Italy, Vittorio Emmanuel II, and was finished in 1925. It is 70 metres tall and 135 metres wide, and houses the Tomb of the Unnamed Soldier. Various none-too-complimenting names have been given to it by the natives, for example "the wedding cake". It does indeed light up when compared to the nearby buildings which are mostly grey or brown, and doesn't look too beautiful next to the ancient ruins of the Forum area. Dinner was done in a nearby Chinese cafe-style place, nothing fancy, but good and inexpensive food, and it is always a safe bet, in case you don't want to sample the local cuisine. Day 2: Via Appia Antica and Catacombs...but where is the ancient road? A full day was set aside for visiting the Via Appia Antica, which according to pictures and brochures seemed almost like a natural park with several ruins along the way, in addition to a possibility to visit the famous catacombs (of which Rome has many separate in various places). It would however prove to be a challenge to actually get there, and another experience with 'the Italian way'. But first..the breakfast at the hotel deserves special mention. Of the places I have stayed so far, this surpasses them all - the variety and selection of foodstuff was simply amazing - and everything was top quality - especially the fresh fruit (kiwi, pineapple etc), and they even had champagne or white wine (did not try this..a bit too early for alcohol consumption!) It did however come at a hefty price tag - EUR 26 per person. At first, the so-called Archeobus would be the obvious choice to go for - a hop-on, hop-off route which went around the Appian road, so this one was sought out right in front of the Termini station, at the Piazza dei Cinquecento, which is the main bus station. Asking for a ticket at the bus was returned with a not-too eager pointing out of the ticket office, to which there was a huge line. No choice obviously, but to get in there. While standing in the queue, an official tourist helper of some sort came and asked what kind of ticket was wanted. "Oh, for the Archeobus you can buy it directly on the bus!". "Ok, sometimes you can buy a ticket directly on the bus". Oh well..he was trying to help at least. Finally reaching the ticket counter, the conclusion from the seller was that the upcoming bus was full. But maybe come back in an hour or so and if you are lucky you can get a ticket for the next one. Right..after all, time does not pass by when you wait, only when you go sightseeing. A return trip to the hotel to ask for help there was done. 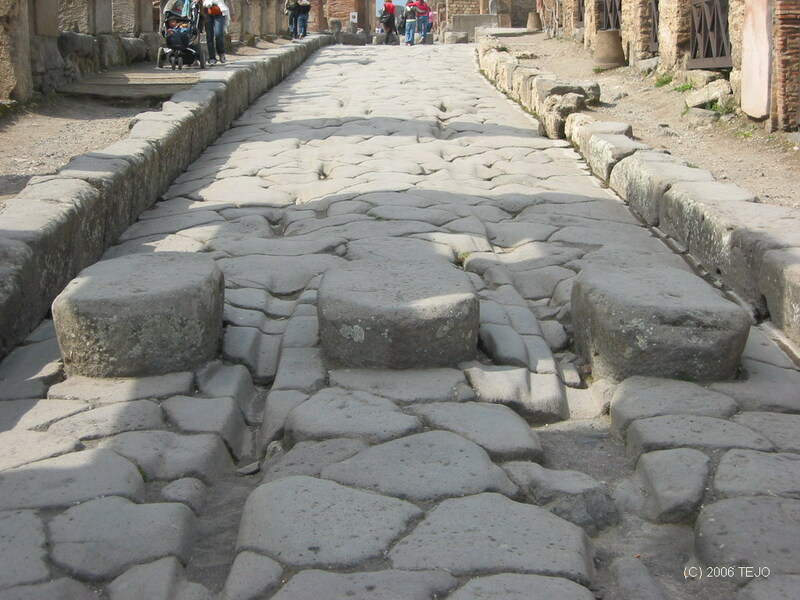 They came up with a route for getting to the start of the Via Appia Antica, yet two separate bus journeys were given. After a bit of fiddling with the printed papers, it turned out the first leg was getting to the bus station outside Termini! That was really not necessary, so another trip was made back there. Newspaper/tobacco kiosks/stands sell bus and tram tickets - you can't buy them on the bus or at the ticket office either. At least it is simple enough (and cheap - 1 euro per ticket) once you know how the system works, although it may at times be confusing. Checking the map carefully while being southward bound, the correct stop was reached, and it was time to check the guidebook. The bus stop was near a big area of ancient thermal baths, but no sign saying anything about the Appian way. Something was wrong here..it didn't quite match with the guidebook either, and after a bit of pondering and head scratching, it was concluded that the guidebook was wrong - two almost identical road names misplaced. 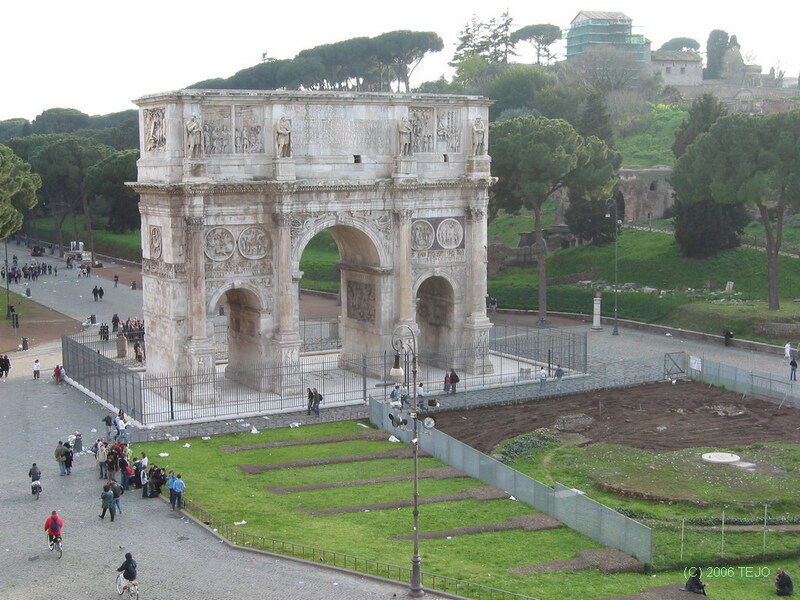 Finally, the Porta di San Sebastiano was reached, which marked the start of the Via Appia Antica, and the beginning of the Aurelian wall. From here, the Via went straight south, but..heavy traffic marred the experience to say the least. This was nothing like the expected natural park. No pavement and high speed cars turned the walk into a somewhat dangerous and dusty experience. After quite a bit of walking, an area resembling a park was reached - near the Catacombe di San Sebastiano. These would be visited but...it was closed for siesta between 12 and 14. More waiting to do..at least the weather was nice and the traffic was more remote. The visit to the catacombs proved to be an exciting experience - it is almost unimaginable that these catacombs alone house 500.000 graves! With all its stairs and labyrinthine network, it is no wonder that tourists are only allowed inside on a guided tour. One slight quirk - the guide at some point spoke a few Italian words, with the conclusion that since we all (foreign tourists) were going to Italy, we really should learn some Italian. I was suggested to ask if she would learn some Chinese if she would go on a short shopping trip to Beijing..I know Italians who visit Norway don't learn Norwegian beforehand, so why should there be different rules for us? Italian is only spoken in Italy after all, and is not considered a world language by far. After the trip it was time for the fun of cars rushing by at excessive speeds again while clinging to the narrow road, which sides were blocked by walls. Upon reaching the Porta di San Sebastiano, this one was entered and the traffic inside was much less than that outside, due to it being a one-lane road. All in all, it was amazing to see how much of this day was wasted with waiting, fiddling, searching and head scratching. There could have been more signs around as well, that is for sure. Finding a place to eat outside the tourist centres at lunchtime isn't easy either, since they will either be completely absent, or closed until the evening. Day 3 - Long excursion! On the day before it was decided to book a place on a guided tour to Pompeii. The weather forecast was promising, and indeed on the next day, the weather was absolutely marvellous. 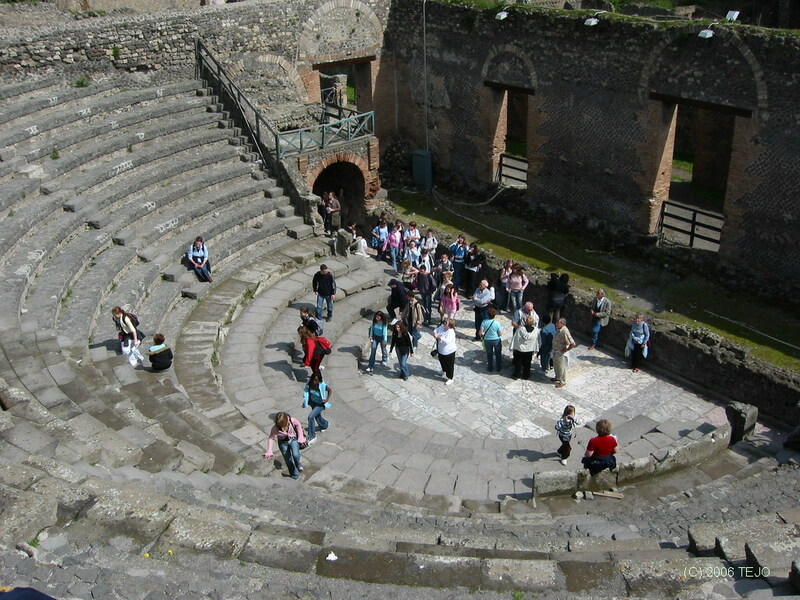 The chosen tour was one from the company 'Appian Lina', and they arranged with pick-up shuttle buses from the various hotels to their starting location. Unfortunately, the pick-up was so early that there was no chance for a breakfast, but a small breakfast bag was instead fixed from the hotel's side at no additional cost (kudos to them for that). There was quite a bit of wait before the actual bus left from the Appian Line office, in between which the ticket was paid for (105 EUR per person). Once on the bus, a disappointing sign showed that no consumption of food or drink was allowed on board. That's all fine with Italians, who barely gulp down an espresso and on a lucky day a glass of orange juice in the morning, but for tourists who are used to real breakfasts, it was the first let-down of the trip. After more than an hour, the bus stopped at a local cafe, and by this time stomachs were growling all around. There was barely enough time to consume the contents of the breakfast package, since Italians don't eat much breakfast anyway, and we as tourists still had to follow this principle. The guide for the day was a substitute, as the regular one was on sick leave. She was a bit uninspiring in her description of the tour and the countryside, and not much of what was said is recalled now. After 3 hours, we arrived in Napoli (Naples), and the side we came in via is the most ugly part of a city that I have ever seen, even making the back alleys of Saigon look like green parks. Indescribably ugly building blocks, huge amounts of litter and scrap lying around, no seeming attempt at preserving buildings before they fall down, chaotic traffic and poor roads all added to the impression. One can only smile at the irony of the expression 'see Naples and die - Vedi Napoli e poi Muori', an expression used during the city's golden age in the 18th century, as it was a sovereignity on its own. The expression means that you must see the beauty of Naples before you die - now, one would be more inclined to think that parts of Naples is so ugly that you will die from shock after having seen it. 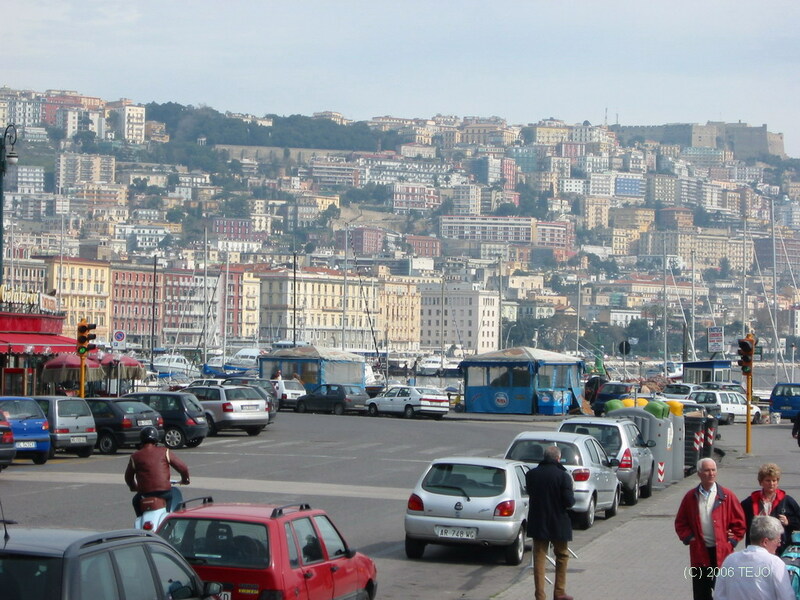 The historical centre is better though, along with the area by the Bay of Napoli. We picked up a local historian/guide on the way, and he told a bit about the city, after which we had a stop by the bay, which was so far the most pleasant experience of the tour. After four hours, some of the tourists on the bus were getting impatient (americans), and asked if the tour actually did go to Pompeii. I would agree with them to some extent at this point - this is what we would want to see after all. 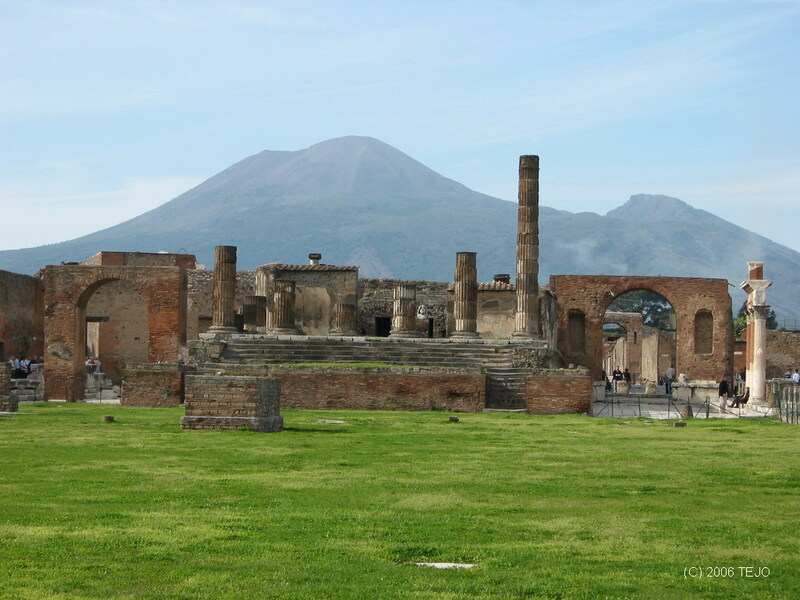 Some 30 km along the bay area lies the town of Pompeii itself, now a modern town adjacent to the historical ruin. We stopped for lunch at a local restaurant here, where we were served the most disappointing meal I have ever had in Italy. Wine and coffee came at an additional cost, which they forgot to mention until after you had been served it. Finally the time had come to enter the ruins themselves. Somewhat sadly, no amnesty was given to walk independently of the group - one would miss out on the actual tour, it was said, but there would be enough time given to roam around after the guiding was complete, which took some two hours but was quite interesting mostly. The ruins themselves are a wonderful experience - the town feels almost as if it had been abandoned recently, even nearly two thousand years after its day of doom, when Mt Vesuvius decided to wipe it out on a fateful day in AD 79. It shot out millions of tonnes of rock and debris, but what caused the majority of deaths in Pompeii and nearby Herculaneum was when the volcanic ash column collapsed on itself and created a so-called pyroclastic surge, which travels at a speed of well over 100 km/h and has a temperature of 500°C, instantly incinerating and vaporizing all organic material it touches. 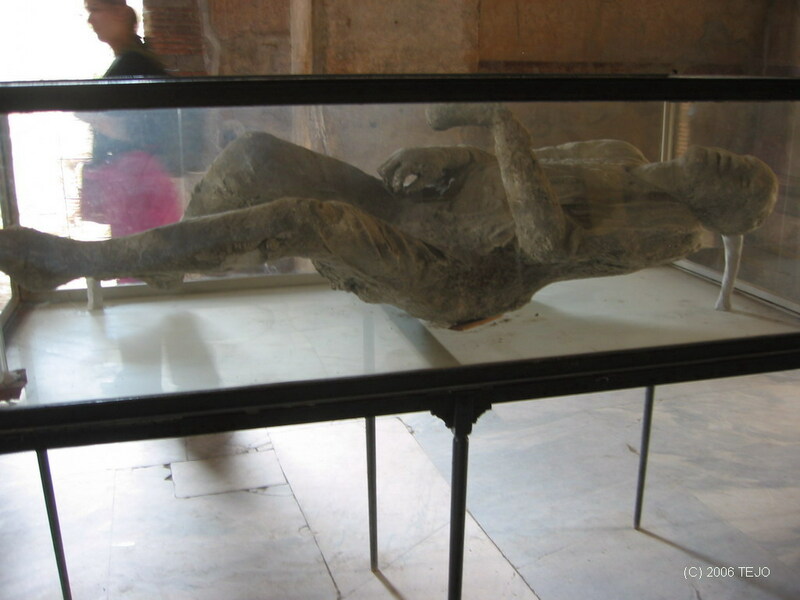 This was also how the gruesome replicas of the bodies could be re-created: as they were covered in hot ash and stone, while the flesh of the bodies vaporized, the cavity they had filled remained, so that these could be filled up again with gypsum or whatnot. 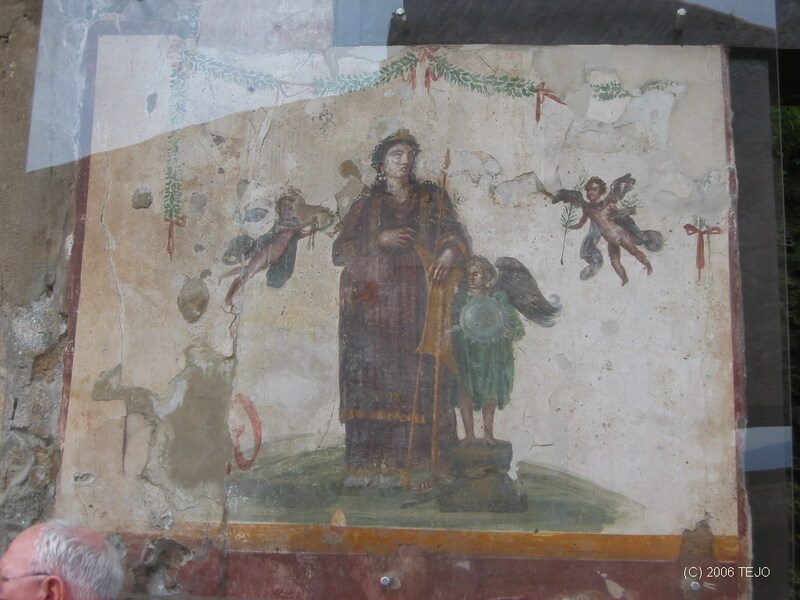 Pompeii was rediscovered in the late 18th century, and dug out since from the ash and rock that buried it, which is why so much of it is still well preserved - frescoes and floor mosaic look beautiful still. And no part of the town is shut off - one can walk into people's houses and try to imagine everyday life 2000 years ago - usually that is, as the 'red light district' was under restoration, to the disappointment of some (though I doubt any services are performed there nowadays). After the guiding was complete, we were left with 20 minutes of time on our own before returning to the bus. Not much to cover the rest of the town, including the large amphitheatre at the other end, so some time was spent at a quiet corner of the Forum area. Then it was back to the bus again, which was to meet with and pick up some tourists from a two-day trip to Sorrento. The organisation was done in true Italian style as we were getting used to by now, meaning there was waiting time - and a lot of it. The other group was delayed by more than half an hour, and it felt irritating to say the least to have to twiddle your thumbs on the bus for this long when you were so strictly ordered to return in time. Finally it was time for the return trip - another 3+ hours on the densely trafficked autostrada. 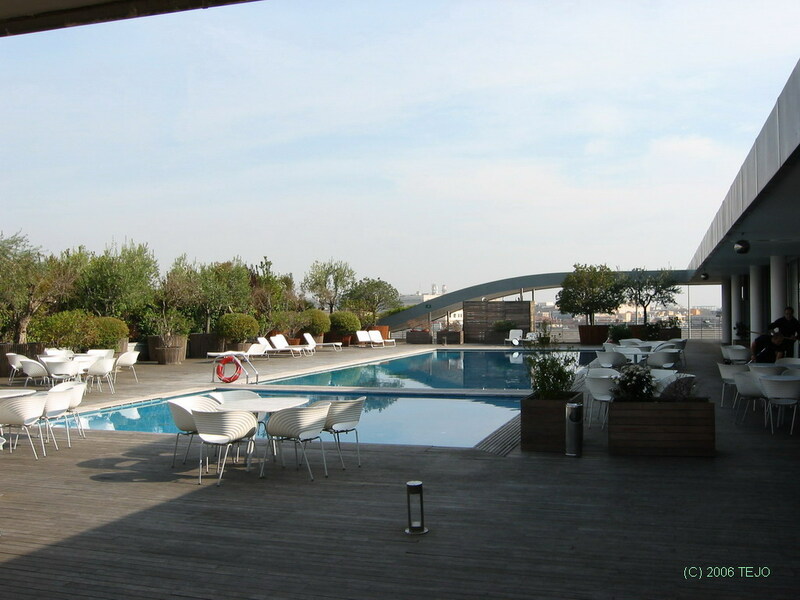 After 14 hours of day trip, it was good to return to the haven of the rooftop terrace of the hotel! Day 4 - "How to do Rome in one day"
The above heading is a bit of an exaggeration though - but a lot was covered by doing the chosen route, thus: took the 'A' subway from Roma Termini to the station named Ottaviano - San Pietro. 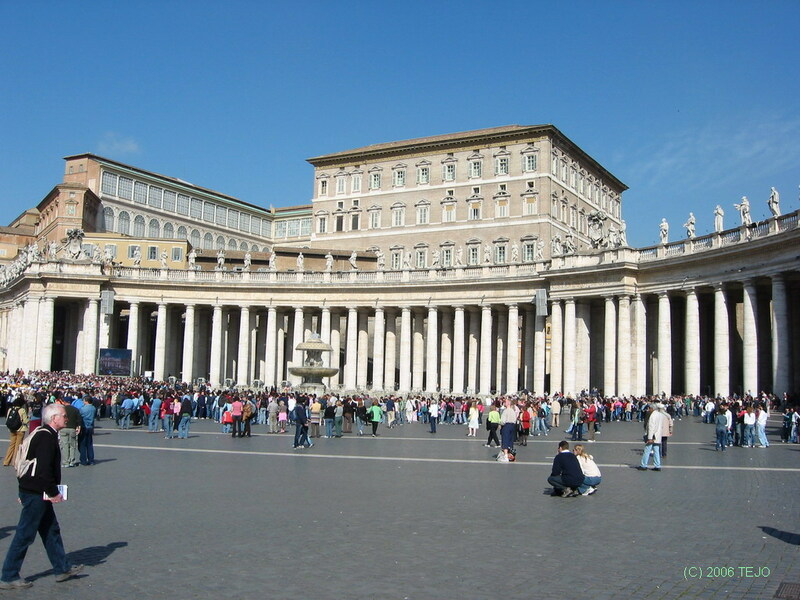 From here, it was a relatively short walk to the border of the Vatican state, which is indeed a sovereign state in the middle of Rome, the world's smallest, and the most holy of places for catholics. It is guarded by the well known Swiss guards - although they look a bit like clowns in their costumes, these are all well trained soldiers. 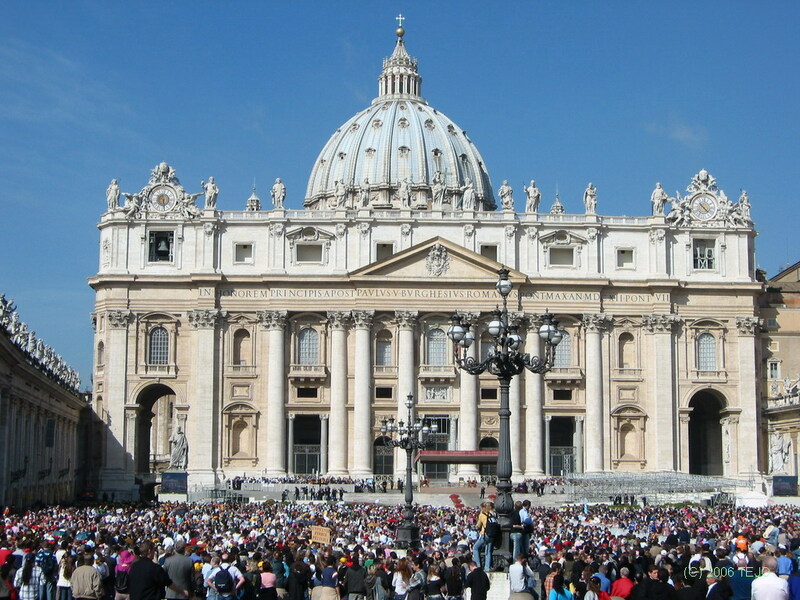 Instead of aiming for the Vatican museums, a direct course was set for the Basilica di San Pietro (St Peter's Basilica). Getting through to the enormous piazza was like getting through security at an airport - a necessary 'evil' of sorts. The piazza itself is indeed huge, yet with all the colonnades and other large buildings around, the cathedral doesn't look quite as big as one would imagine at first. Still, it is difficult for the eye to comprehend the actual scale of the surroundings once one is right in the middle of St Peter's Square. It was a wednesday, and the 'new' Pope had chosen this as his appear-to-the-public day, so we came in the middle of a crowd of devoted visitors, and managed to get a glimpse of him driving around (although not by himself) and listening to bits and pieces of the mass in various languages (including latin). Therefore, there was no access to the Basilica either, which was a bit of a letdown - with the great weather, a visit to the top of the cupola would have been quite an experience. Since the visit to the Vatican state was this short, it would have to be considered for a possible return trip. The walk continued out from the piazza to the Castel Sant Angelo. This was originally built as a mausoleum for emperor Hadrian, from AD 135-139. 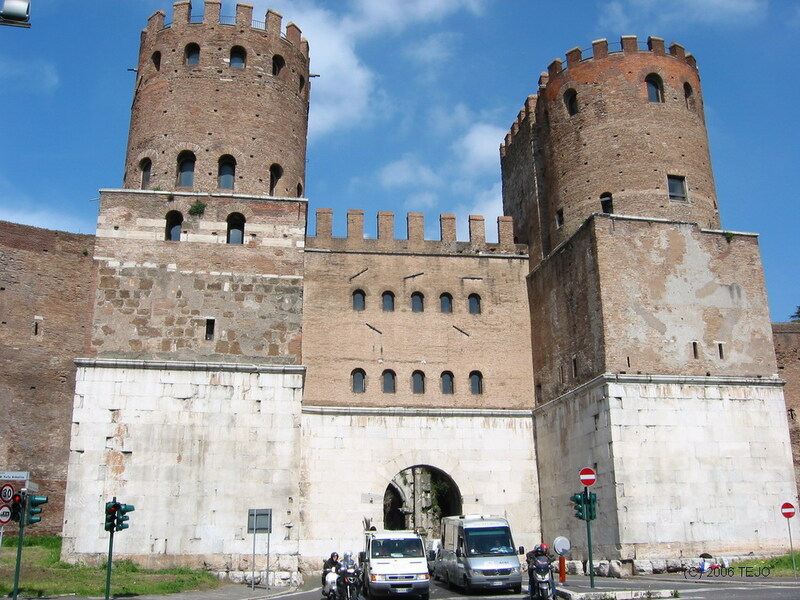 It was turned into a military fortress in around AD 400, before it was finally converted to a castle in the 14th century by the popes, and was connected to St Peter's Basilica by a fortified corridor. 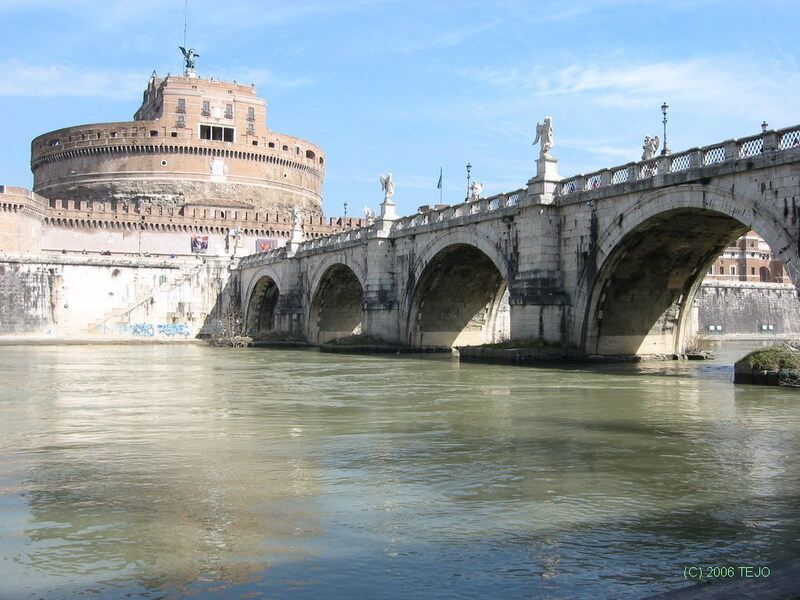 The bridge leading over the Tiber is also worth a stroll - take a picture of the statue covered bridge with the castle in the background, just ignore the crowd of lined-up salespeople - they are there because this is a tourist area. 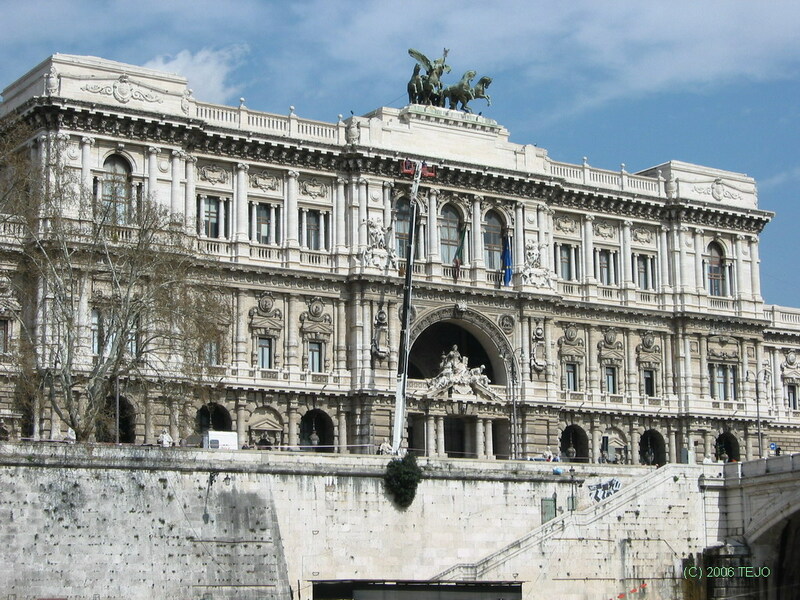 A short walk along the Tiber, and you pass the courthouse, which is quite large and pompous. Next on the list was the Piazza Navona, a very pleasant and huge open circular place, originally a circus in the 1st century. 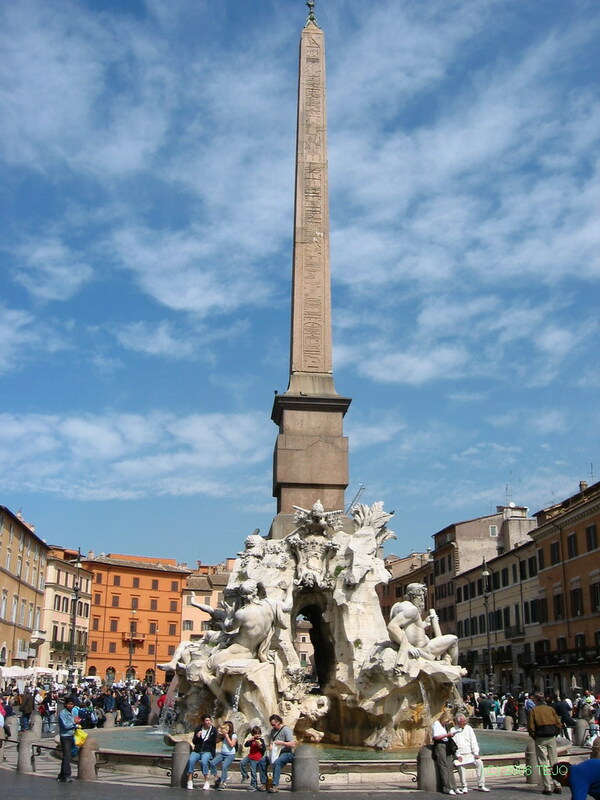 It is a pedestrian area and its main features are three fountains, the dominant being the central Fontana dei Quattro Fiumi (Four Rivers Fountain), which is a tribute to the four great rivers of the world: the Nile, Ganges, Danube and Rio de la Plata (why not the Amazon I wonder). The piazza's circumference is dotted with cafes and restaurants - again, a typical tourist area, yet pleasantly shielded from traffic. 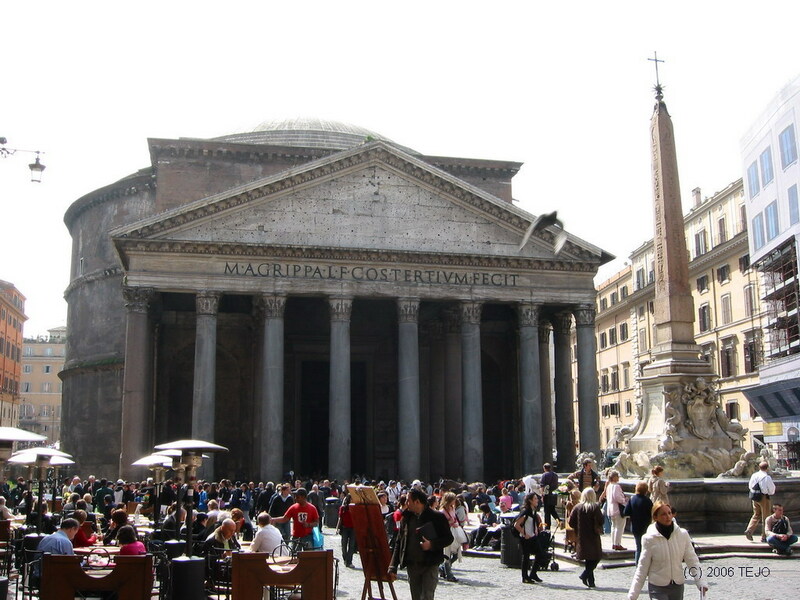 The Pantheon was also paid a visit. This monumental building was originally a temple to the seven deities of the seven planets in the state religion of ancient Rome, but has been a church since the 7th century. 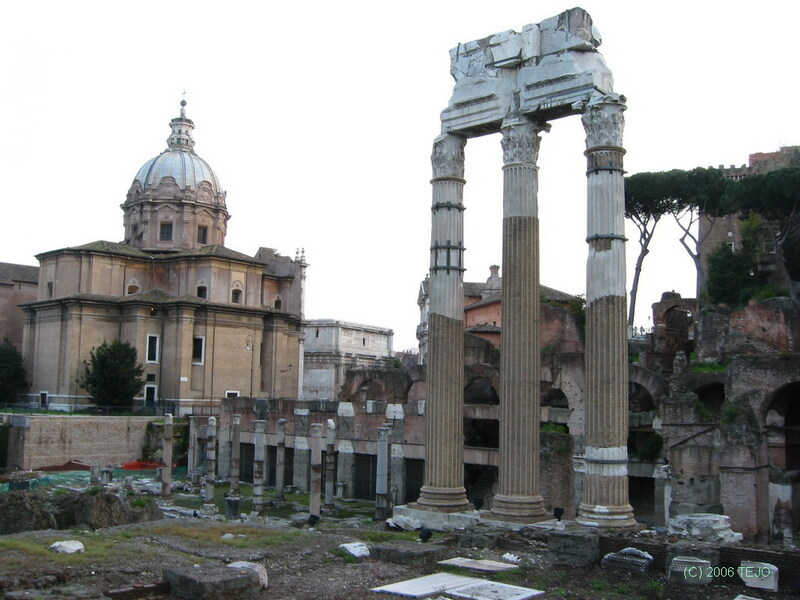 It is the best-preserved of all ancient Roman buildings, even though the one standing is not the original one, which was destroyed in a fire in AD 80, and the "new" one is from AD 125. The domed ceiling is an impressive sight, and with the open circle at the top - the Oculus (Great Eye), often results in some atmospheric lighting inside. The height from the floor to the top of the dome is exactly the same as the diameter of the interior - 43.3 metres. The oculus serves as a free ventilation system, as it creates a slight suction from the ground entrance when wind passes over it. Vittorio Emmanuel II's sarcophagus is visible in the wall in the interior of the church/temple. A short stop for lunch was added, also in a pedestrian area, and a bowl of minestrone soup was enjoyed in the pleasant springy sunshine while watching parts of the world pass by. 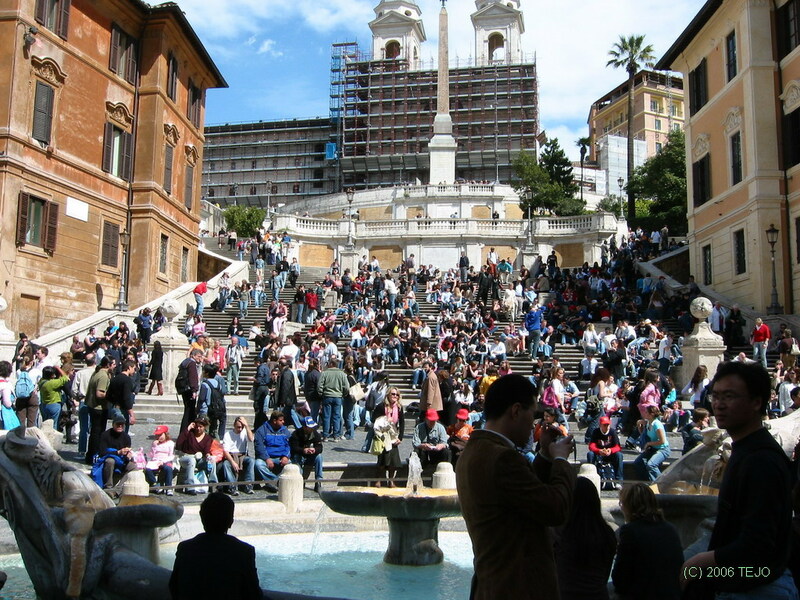 After this, it was time to visit the Fontana di Trevi (Trevi Fountain), yet another well known place. As fountain decorations go, this is a very large one, yet it is the statue against the wall that is impressive, not the fountain itself. 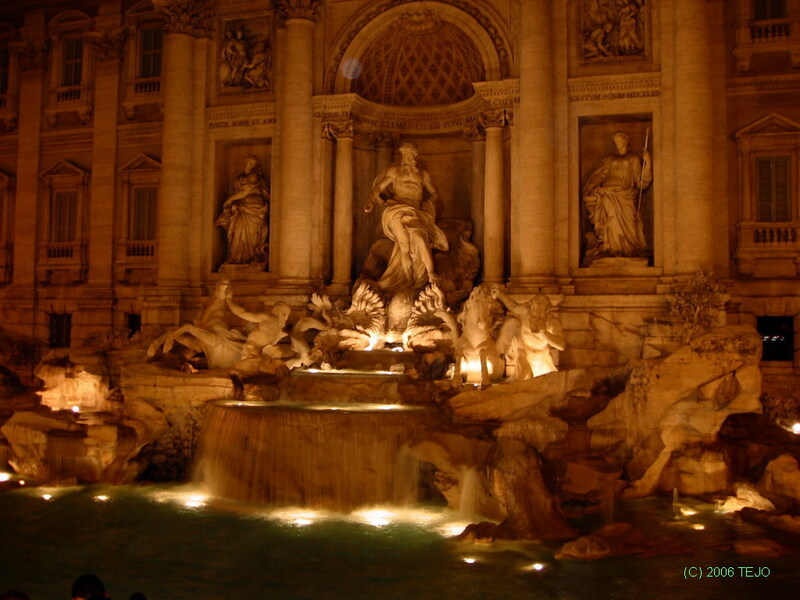 According to legend, if you toss a coin into the fountain, chances are good you will return to Rome. I have a theory that you are able to return even without doing this, and presume to be able to prove it during the spring of 2008. The piazza is a much loved place for people watching, and one pair stood out amidst the rest - an elderly U.S. couple where the man wore a screaming yellow suit, yet prize of the year for most ghastly outfit went to the woman, who dressed as if she were in her thirties, and even if she had been thirty, it would have been a revolting attire. Barely able to walk on her high heels, she was guided down the stairs by her hubby. Also, the amount of make-up and facelifts performed would probably put even the most spoiled movie star to shame, yet the downside of such vanity is that your skin will eventually protest to such unkind treatment, and it showed all too well here. The evening was spent doing another trip offered by the Appian Line tour company. 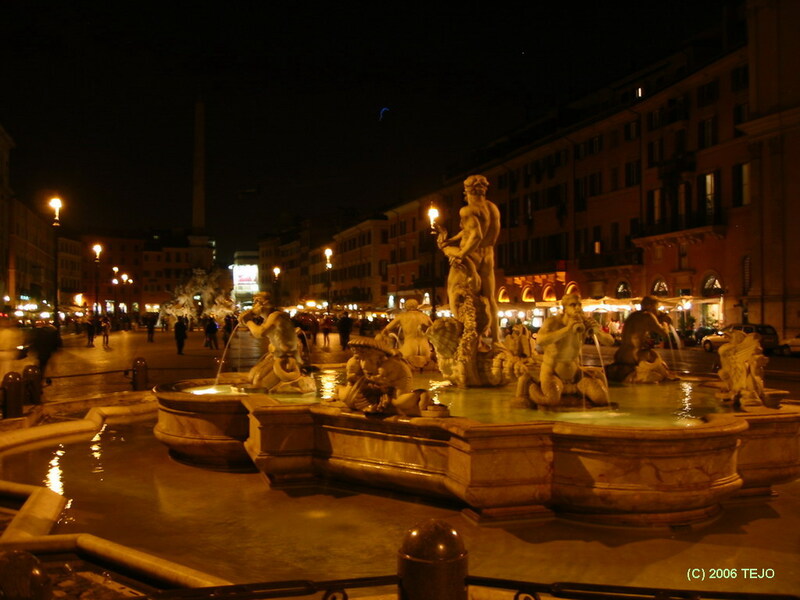 It was a 2-hour roundtrip called 'Illuminated Rome', where most of the major sights were passed by, yet no time was given for photography apart from the two stops that required walking to get to: Piazza Navona and Fontana di Trevi. These were very impressive at night, yet the Fontana di Trevi experience was marred by some very obtrusive tourist trappers. Seemingly pleasantly flattering at first, one of them was even visibly offended a tacky stunt failed and there was no sale (read: tourist not so easily tricked). The guide was very informative and humorous, as well as well-spoken in several languages (English, German and Spanish), so this trip gave a better impression of the company than the Pompeii one. 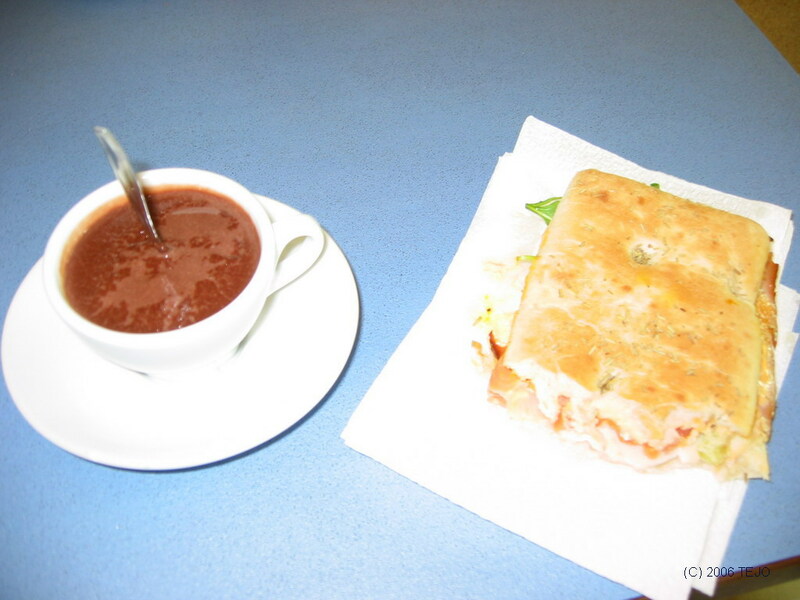 The Termini station was also good to have nearby to drop by for a snack or coffee break, and on one night, a hot chocolate was ordered - this must have been the equivalent of the espresso, as the spoon was able to stand upright in the liquid!